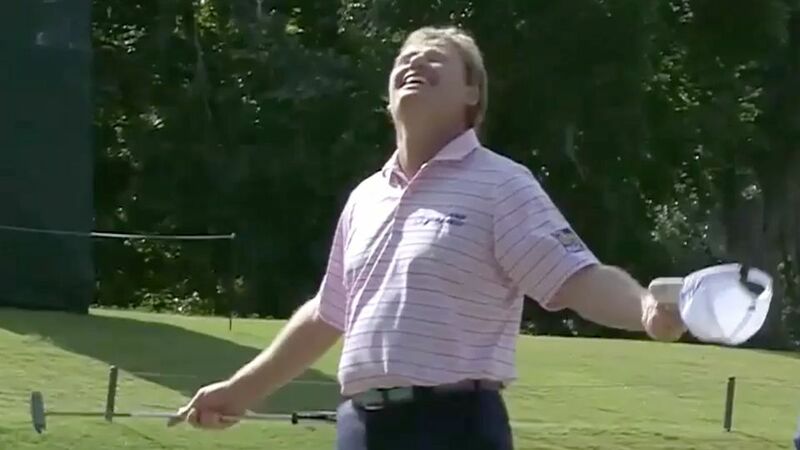 Ernie Els' yips are back. If you needed any further proof that no pro is safe from the dreaded affliction, Els' missed 18-inch putt at the South African Open Thursday should seal the deal. This isn't the first time Els has come down with a bad case of the mentally paralyzing yips, causing him to miss putts that seem effortless (see below). He also failed to sink a similarly close putt at the Alfred Dunhill Links Championship in October. In an interview afterward, Els blamed his performance partly on the fact that he had been using a longer putter. But he also said that he was "a little bit jumpy." "It was a disaster," he said. "Anybody's ever seen the yips, obviously that was the perfect yip stroke you've ever seen in your life. It is what it is. The game of golf you've got to do some silly things when you play long enough… Hopefully I won't have too many of those again, because you can't play golf like that." Here's hoping that today's mishap really will be his last brush with the yips.